Chart-topping singer Ed Sheeran said he initially struggled to get a record deal because he was "ginger and chubby". The flame-haired 22-year-old, whose hits include The A Team and Lego House, said self-belief and perseverance helped him make it in the record industry, despite knock-backs on his appearance. Ed, previously romantically - but erroneously, he said - linked with fellow pop star Taylor Swift, revealed he once had to perform in an empty concert venue to just a sound engineer after nobody turned up, but he continued to have faith in his guitar-based sound. Speaking to online youth television channel SB.TV in association with the National Citizen Service (NCS), Ed said: "I thought to myself this seriously isn't going to work. "I felt every gig I played, fewer and fewer people would attend and this was going nowhere. Every single label I had gone to at the time had told me this song wasn't a hit, this song wouldn't work, and the fact that I was slightly chubby and ginger wasn't a good 'marketing tool' for them. So yeah it did definitely feel like it wasn't going to happen. "The way I maintained self-belief is that I knew I wasn't good at anything else so what else was I going to do, and secondly with the whole look and songs that the labels rejected I knew it was really important you stay true to yourself. Being an individual makes you stand out from the crowd." 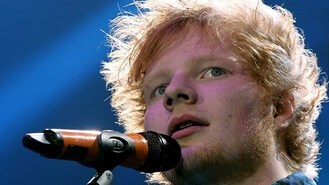 Ed has gone on to win Brit Awards off the strength of his debut long-player, the five-times platinum +. His video on SB.TV is one of a number from the likes of singer Rita Ora and rapper Wrench 32 to share how self-belief made a difference to their lives and encourage young people to believe in themselves and make the right decisions. Ed added: "It's like if you want something so badly go out there and grab, just keep on doing it - because there are people out there who do want it just as much as you do and there are people out there if given the opportunity to take my place will, so it's just as important to keep pushing yourself and working at it." The NCS is offering three-week residential courses to develop skills and confidence for 16 and 17-year-olds in England. For more information, visit NCSyes.co.uk or www.facebook.com/ncs. Justin Bieber will address his very public ups and downs with his new album, Scooter Braun has promised. Lady Gaga has performed for the first time since having hip surgery in February. Leonard Cohen has apologised to fans for shifting a pair of dates on his UK tour - after he realised they had been scheduled on Jewish holy days. Cillian Murphy has made his directorial debut - with a music video for Manchester group Money. Sir Bruce Forsyth described his Glastonbury Festival debut as one of the biggest and best shows of his life. The Rolling Stones provided the best-ever headline set in Glastonbury's history, organisers said. Michael Buble kicked off the first show of his ten night residency at London's O2 arena in a suitably jazzy style.